Mixed emotions Wednesday morning. Woke to the usual flawless blue sky, warm sunshine and fabulous views. Finished packing, breakfast on the hotel terrace, caffeine fix in the coffee shop opposite, and saying goodbye to good friends. I will miss it all. But I was going home. Looking forward to seeing family and friends. Glad of the opportunity to try to catch up on a lot of things which haven’t been done in the house and garden for the last 18 months and which have been increasingly preying on my mind. Once again the journey was not without incident, but thankfully only minor ones. I had booked my ferry ticket 10 days ago and had checked it with the ticket office when I spotted on the internet that the times had been changed. “The ticket is OK but the time has changed from 09.20 to 10.00” was the clear message. Only the message hadn’t got through to the crew on the ferry. When I presented my ticket I was told that it wasn’t acceptable. I would have to change it at the harbourside ticket kiosk. It suddenly became a major issue because the turn-round time on Dodecanese Seaways high speed catamarans is very fast and slick. And I was by no means the only person with the wrong time on the tickets. There were a lot of us. I ran across to the kiosk and found one person ahead of me with the same problem and a stream of others running behind me. The guy in the kiosk started to phone Head Office, the same procedure as on Kalymnos when I nearly didn’t get a ticket at all. Then, as if realising the scale of the problem, notably that there were 50 or more passengers in danger of missing the ferry and thereby missing their flight, he ditched the phone idea, opened the kiosk door and ran to the ferry shouting to the streams of would-be passengers “The tickets are OK. The tickets are OK”. He ran onto the ferry and starting shouting in Greek at the crew checking the tickets in terms which I suspect our Greek tutor would not have taught us under any circumstances. There was then a lot of angry shouting and arm waving during which, having followed the guy from the kiosk to the front of the queue, I thrust my ticket into the hand of the guy collecting them and walked onto the boat. The ticket-guy then threw up his arms and exclaimed something along the lines of ‘ Oh! bugger it’ … and suddenly everybody else flooded on. Within a very few minutes the ferry pulled up the drawbridge and shot off from the harbourside at customary high speed. Potentially major problem averted. Had I, and a lot of others, not got on that ferry we would have missed our flight home. Sat back in the sun on the outside deck with a sigh of relief. Very pleasant walking from the harbour in Rhodes in the late morning Autumn sun. No hurry, plenty of time to get to the airport for the flight at 15.10. I had intended to catch the bus to the airport rather than a taxi, €2.20 rather than €22. Perhaps as well really because the taxi drivers were once again on strike. Arrived at the airport just after 12.00 in plenty of time so, declining the opportunity to join one of the three already 30 metre-long queues at check-in straight away, I bought a snack and a drink and went and sat outside in the shade for an hour or so. I ambled around in the last of the decent sunshine I was likely to see for a long while and then went inside to join one of the queues. Rhodes ‘Diagoras’ airport has a new terminal building but has succeeded in maintaining all the atmosphere of a huge cattle-shed. The queuing for check-in here has always been a very unpleasant experience. You just have to switch off your brain and go into stasis, maintaining just enough motor function to shuffle forward every few minutes and hope that they will finally put you out of your misery before you lose control and run amok. The problem is that the whole system is badly set up and managed. Basic Systems Management skills could improve it dramatically. Wednesday was an order of magnitude worse than normal. Progress was glacial. I joined the queue at 13.15 and reached the front at 15.00, ten minutes before scheduled take-off, by which time staff were panicking. After this there was another queue to put the Big Bags through the security scanners. Then a queue for security scans for bodies and cabin luggage. Then for passport control. Then finally for the gate out onto the tarmac. Amazingly after all that the plane took off only half an hour late. It was an uneventful flight, unlike the flight out to Rhodes which many of the people had been on the week before. Apparently there had been very disruptive and offensive behaviour on the plane. We learned this because before in his pre-takeoff welcome speech, the pilot announced over the intercom that the offenders were not on board and, indeed, had been banned from flying by all the airlines flying into and from Rhodes. By all accounts their only way off the island was by sea. Just a small sting in the tail on the journey back. The plane landed and taxied to the terminal building. The pilot switched off the seatbelt sign signalling everyone to unbuckle, leave their seats and clear overhead lockers ready to make for the exits. After standing around for an unusually long time the pilot came back on the intercom to explain that the airport authorities were scouring the building to find the man who operated the airbridge. Eventually he was tracked down and we were back. Grey Britain here we come! But let’s be positive. 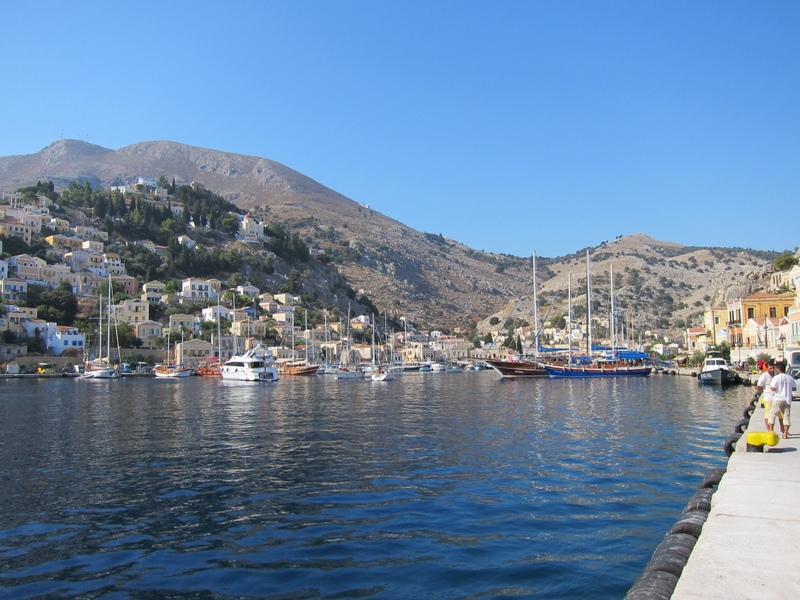 I had a great time on both Kalymnos and Symi. The weather was exceptionally good. It can be a bit cloudy and cool in September but this year it was cloudless the whole time with just enough breeze to take the edge off the heat in the middle of the day. The walking was also exceptionally good on both islands with a mixture of old favourites and new challenges. I got to spend time and relax with some good people. The problems, such as those with the ferries, were no more than we have come to expect in Greece and all resolved themselves with no real inconvenience or hardship. Verdict: a very good Summer. This entry was posted in Greece 2011, Grumpy Old Men. Bookmark the permalink.